Cannon County senior guard Emily Sissom pushes the ball up the court after a steal against DeKalb County. Sissom scored 11 points in the win. JoAnna Young provided the spark that ignited energy in Robert A. Harris Gymnasium and propelled the Lionettes to a 63-35 win against rival DeKalb County in the District 8-AA opener for both teams Saturday night. 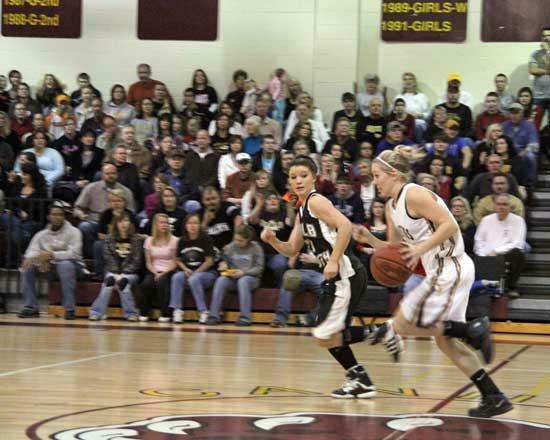 Young's electric play put a charge into the Lionettes during a decisive second-quarter run in which Cannon County turned a 15-12 first-quarter deficit into a 36-22 halftime lead. The game was tied 20-20 when Young entered midway through the second stanza. Her defensive tenacity sparked a 16-2 run the remainder of the quarter as the Lionettes (7-1, 1-0) distanced themselves. "If basketball coaches gave out a game ball it would go to JoAnna Young," Lionettes Head Coach Michael Dodgen said. "She did a great job and gave us a tremendous spark coming off the bench. She made a difference defensively and caused their point guard some problems. As long as she is giving us good quality minutes like that she is going to see the floor." Four Lionettes, led by Chelsey Payne, reached double figures. Payne scored 16 points, collected five rebounds and secured five steals. Taylor King finished with 12 points, followed by Emily Sissom with 11 and Abby Sissom with 10. The well-balanced scoring effort helped Cannon County enjoy victory against their rival for the 27th consecutive time, a remarkable streak dating back to 1999. Most of the Lionettes' offensive prowess fed off of a determined defensive display. Cannon County held DeKalb County without a field goal during a three-minute span in the second quarter and allowed just one field goal in the final four minutes to turn the game for good. The defensive pressure helped overcome a slow start that saw DeKalb County take the early 15-12 lead after the first quarter. "We knew we had to step up," said Young, who finished with six points, collected four steals and drew a charge. "Our defensive improved and that led to a lot of layups. Our defense was the difference." There was no panic after DeKalb County's Martha Webb, who finished with a game-high 20 points, connected for consecutive first-quarter 3-pointers to stake the Tigerettes to an early lead. "You can't panic," Dodgen said. "DeKalb County is an improved basketball team. They came out ready and hit some shots early. Once we settled down and started playing improved defense we were fine. Our defense up top created a lot of layups for us in that second quarter. I don't believe we ran a set in the second quarter. It was either layups or an open shot on the perimeter caused by turnovers. That was a good defensive effort." After allowing 15 first-quarter points, Cannon County's stifling defense held DeKalb County to 20 points the remainder of the game. The Lionettes continued to struggle from long range, connecting on just 1-of-15 3-point attempts. Dodgen said the slow shooting start is not a cause for concern. "We are going to start hitting those shots because we have good shooters," Dodgen said. "It it was something that happens all of the time I would be worried, but I'm not. Shooters go through slumps and all of ours seem to be going through that early in the season and at the same time. We just have some kids who are not hitting shots right now. We are going to start hitting those shots and getting these shooters going." Cannon County will face its fourth Class AAA opponent when it plays at Warren County Monday at 6 p.m. It was one of the best defensive games I have seen in a long time from a player coming off the bench like JoAnna did. She had three steals and two points in the first three minutes she was in the game. The Dekalb girls couldn't get it past half court when she was on the point guard! They never recovered from JoAnna's defensive prowess!